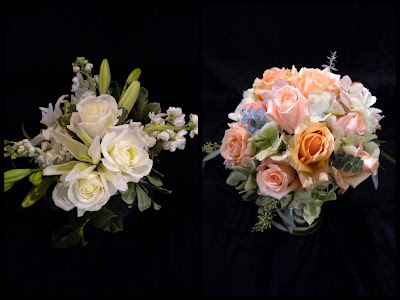 We love to make beautiful bouquets and the bridal show is a perfect time to try out new techniques and show you all the latest and greatest bridal trends. Whites and greens are always a fresh combination with accents of hypericum berries and rolled ti leaves among a bed of creamy white roses. 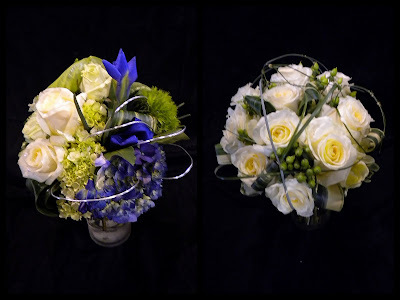 While in contrast we also created a gorgeous contemporary style bouquet with blue hydrangea silver wire and green anthirium. 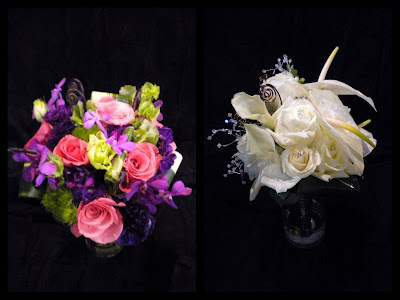 Here is a beautiful bright bouquet in pinks, purples and greens with roses, ti leaves, orchids, lisianthus, trick and stock, in contrast to a beautiful white bouquet with crystal accents amongst roses, anthirium and miniature calla lilies. 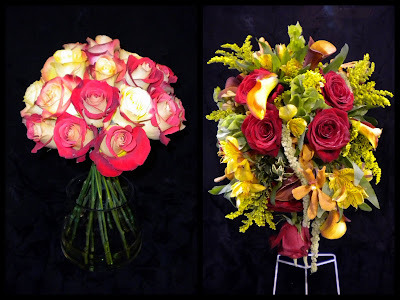 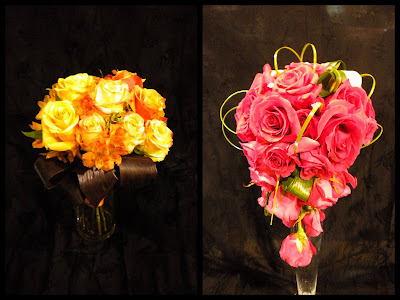 Then of course we have to show off the vibrant colors of fall with rich orange roses and dark ti leaves, and a vivid hot pink cascade bouquet of all roses and grass. Fall colors are always a hit with two tone roses in a traditional spiral stem wrap where it stands up by itself, or a modern cascade in a teardrop shape with callas, roses, orchids and amaranthus. Stay tuned for part 3 of our showcase!